Want to become a CNA in Baltimore? CNA jobs are projected to grow 11% by 2026, and Baltimore has a high level of employment with 14,000 registered nurse aids in the city. Baltimore is a top-ranked city for CNA wages, which average at $15/hour, but the top 10% of the nation’s nurse aids earn $50,000. What are the CNA requirements in Maryland? Here’s how to prepare for your CNA state exam and how to become a Certified Nurse Assistant in Maryland. To start a CNA training program, you need to be at least 16 years old, have a high school diploma or the equivalent, pass a criminal background check, and have up-to-date immunization records. Next, you will need to find accredited CNA classes in Baltimore and successfully graduate from the nursing assistant program. You must then pass the required state exam and register online on the Maryland Nurse Registry in order to qualify for a CNA job in Baltimore. You can also get more detailed information by connecting to our page at How to Become a CNA in Maryland. If you can’t find a fully-funded CNA program, you can also opt for a partially-funded program such as the Certified Nurse Assistant Training Program with Goodwill Baltimore. The 11-week training program provides low-cost CNA classes for low-income students who just pay a nominal eligibility fee and must pass a nurse entrance interview. After graduation, the career counselors also help students find CNA jobs in Baltimore for next 5 years. You must be 18 years old, have no criminal background, and pass a reading and math assessment. Employers are in need of nursing assistants and many are willing to pay for your training and certification. CNAs are able to promote quickly and advance to levels such as Licensed Practical Nurses and Registered Nurses. Due to this career advancement, there is a high turn-around rate for CNAs and employers must fill their nurse vacancies. In Maryland, if you are employed within 12 months of completing the training, you can apply for your employer to reimburse your training. Before you start your training, search for CNA jobs in Baltimore to connect with possible employers. Speak with the Human Resources department and ask if they reimburse for training or if they have partnerships with specific CNA schools. They may even pay for your state exam fees or provide on-the-job training. Nearly half of all CNAs are employed at nursing facilities, followed by 30% at hospitals and 13% at assisted living facilities, according to the Bureau of Labor Statistics. In addition to providing training, Job Corps helps students with daily living expenses such as residential housing, food service, health and dental care, a bi-weekly basic living allowance, and a clothing allowance. Students can move to the Jobs Corps center where they live, train, and study in their chosen career field. 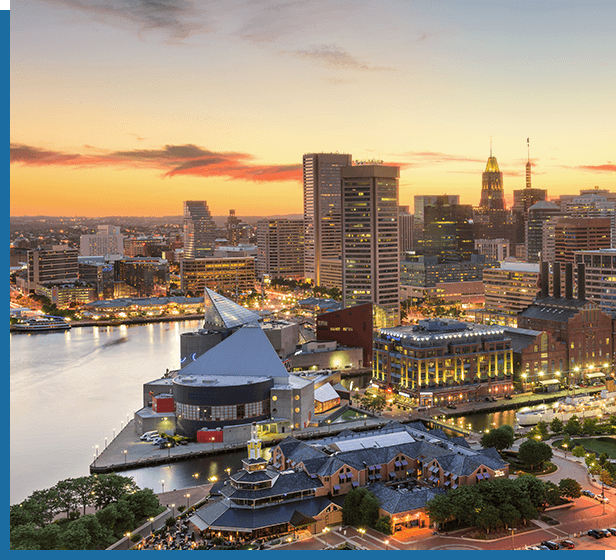 When you graduate, there are careers advisors and counselors who will help you write your resume, plan your career, continue your training on-the-job, and find CNA jobs in Baltimore. Contact the Baltimore Job Corps Center for more information about their Free CNA program in Baltimore. The teacher is so nice. I was able to get a better understand of many medical material from the basic training such as First Aid and CPR to high level Medication Tech., and CNA/GNA training. I took all the classes given there and now I am sure I want to be Nurse. Everyone should go here ! They won't regret it! - Mildred M.
Working on my second degree from this awesome SON. Lots of support and resources throughout the program. Would recommend for anyone interested in nursing and wanting to pursue a graduate degree in nursing. - Marche G.
A small liberal arts school with a Nursing, Education and Pharmacy School. A warm and supportive environment. - James L.
Class was highly education and I really learned a lot. Although some topics could be difficult the professor did a really good job of simplifying the material into easily comprehended topics. Overall the amount of topics gone over too was incredibly value. My classes instructor was also willing to stay after with anyone who wanted help with any topics or still needed practice with the CPR dummies. Overall had a good time, the class was in a hotel conference room but that made no difference to the educational aspect the class was still easy to pay attention in and involvement was highly encourage and almost forced upon everyone so we all got practice and experience with the technics. - Trent K.
This campus by far has the nicest scenery and is very clean for a community college. Most of the teachers are nice and work to help you for you're benefit. - Mark K.
Attending Top Knowledge Healthcare Institute was an amazing experience for me. I highly recommend it to anyone seeking high quality education, experienced instructors, and realistic introduction into a medical setting. Ms Ada is a kind, dedicated teacher who often goes above and beyond the role of a instructor to ensure that her students are both well prepared and knowledgeable in all related subjects. - Juwan P.
Did my Nurse technician and CNA here, it is simply amazing ! No cutting of corners, you must learn to be what you want to be. High rated instructors, very friendly .I highly recommend Stein Academy. Next step is to get my PCT certification. - Ifeoma D.
Best nursing and pharmacy tech school ever and very professional - Halimat M.
I had the great pleasure and opportunity of learning under the teaching of Joyce Cleargy, RN! She is very patient, loving, nurturing and thorough. Her skills impacted my entire class with a 100% graduation rate. Ms. Cleargy is truly blessed with a special gift and I am forever grateful for her time, dedication and commitment to ensuring our success in the healthcare field! I am also thankful for all of the itWORKS program staff and it's sponsors, such as Mort, Iris Somerville, Kim Rhim and the staff and residents of Fort Washington Rehabilitation Center and I will be recommending this program to others looking to start a career in the nursing field! Become of you all and quite a few not mentioned, I am a CNA/GNA! THANK YOU!!! - Latorya L.
From my first day of class; l knew that Health Focus was the best and the right place for up to the point Nursing Assistant Training education in for me. - Gomba J.